Visiting the parents in Connecticut. To further my goal of visiting three Ivy League Universities in a single week, we went to Yale's Peabody Museum of Natural History. 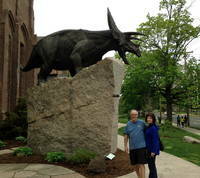 With Mom and Dad at the Peabody Museum. They had a really good Samurai exhibit. And dinosaurs. Me:  Why did the hipster hate the Peabody Museum of Natural History? Me:  Because he liked dinosaurs back when they were underground. Mom: Because dinosaurs aren't hip? Me:  Sorry. It wasn't my best joke. Dad: I don't get it. Me:  It was my best Museum of Natural History joke. Dad: It was like one of my jokes.